0440 - Some kinda penguin? - Heroes Inc.Heroes Inc.
0440 – Some kinda penguin? Alternate POV FTW. This flashback takes place sometime between comic 194 & 195. Anywho, another thing: HI-Wiki – The Official Heroes Inc. Encyclopedia is now up and in need of content. Anyone who wants to volunteer to write some articles about the comic, go on and do it! DO IT! This entry was posted in Story and tagged Dedede, Meta Knight, Toad. Bookmark the permalink. Well, now they are dead. The guards are from Final Fantasy VI, same as Kefka, Locke, and Strago. Oh, yeah, the guards are cops from Earthbound. I thought you ere talking about the soldiers. Also, in my mind, Dedede has the voice of Mr. Larity from Code Monkeys. oh the heroes inc HQ is that in toadtown? @ Alex: Don’t think so; heard of but haven’t read; no. 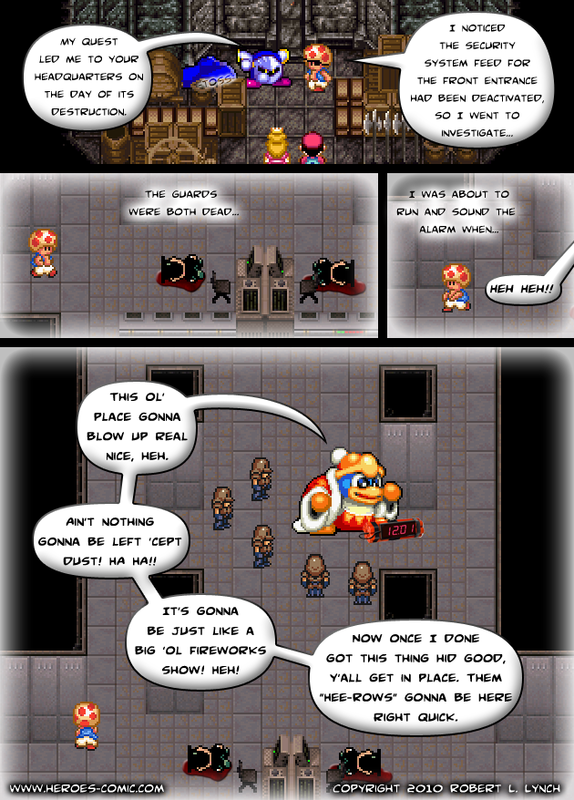 @ Viper: No, Toad Town is like the big main city and capital of the Mushroom Kingdom, and is like the size of Chicago. The city the HQ is in is a smaller, as-of-yet unnamed city about the size of Dayton. I’ll make something up for a city name sooner or later. Alright, for the record, the city the HQ is in (as well as the D-Pad and the Drunk Chocobo) is called Cremini City. ^ This is now canon. It’s y’all. As in you all, the apostrophe going where the “ou” goes. What? I don’t know what you’re talking about, it is now and always has been y’all in the comic. DeDedDe? He’s smarter than I tought, why Viktor would employ that Penguin when there are much more threatening enemies aroud the world. It’s cheaper to buy-out stock villians then to pay big for the heavy-weights. That is why Ganondorf took hold of Bowser and the Koopa Forces during SSBB – the cheaper the payment and the larger the stock troops…the less your loyal guys have to die. well the first artical has been started. It took a while because I reread the comic for info. the info box is messed up i have to fix it and the artical needs to be expaned but its a start. I want to be done with nations by weeks end then do cities then smaller locations. It’s a good start, but you won’t mind if I tweak a few things, will you? First, I’d like to have the majority of the articles written from an in-world point of view. also i’ve been using an online word checker but it seems to have problems so i’ll use my other pc it was word.